In September 2015 we made our extensive archive of LIDAR digital elevation models (DTM – digital terrain models; and DSM – digital surface models) covering over three quarters of England, available as open data. Since then, businesses, local communities and individuals have taken full advantage of the data, using it for all sorts of projects including finding ‘lost’ Roman roads, identifying field boundaries for land management, and determining ideal rooftop locations for solar panel placement. But, that’s not the end for LIDAR. Now, we’re releasing the raw point cloud data that underpins our elevation models. When our aircraft fly over the landscape carrying out a survey, the LIDAR system collects hundreds of millions – sometimes even billions – of point heights measured by bouncing a laser off the landscape below. This three-dimensional collection of points is known as a ‘point cloud’. The point cloud is used to generate the height models that the Environment Agency uses for flood risk modelling and coastal mapping. As well as the height values, much of our point cloud data contains a wealth of additional information, known as ‘attributes’, which are determined by how much laser light is reflected off objects, how the shape of the pulse changes upon reflection, and so forth. This information provides a rich source of extra detail which can be invaluable for scientific research and analysis, and can give more insight into the type of ground feature (vegetation or hard surface) being surveyed, or the time the survey was conducted. By releasing the point cloud data, GIS professionals and expert users of the LIDAR data already released will be able to create their own customized digital elevation models that are specific to their needs, and derive useful products to help better understand the environment we live in. It contains 16,600 km2 of survey data captured between July 2014 and November 2015, equivalent to 10 times the size of greater London. The remainder of our point cloud archive, for surveys going as far back as 2005, will be released by the end of June 2016. 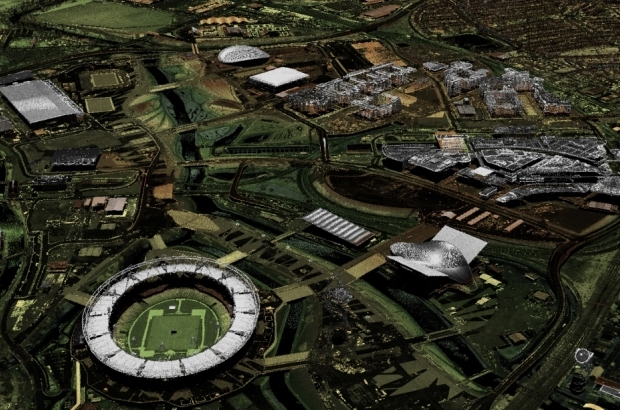 LIDAR data has been released under the #OpenDefra project, which will see 8,000 datasets made publically available by the end of June 2016.